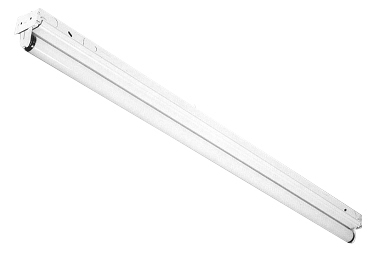 The SLED Flat Board is available in 24″, 36″, 48″, 72″ and 96″ lengths in Flat Board, 1 or 2 LED tubes lamp configurations. Combination snap-in end plates double as couplers, eliminating the need for extra hardware in continuous row applications. Snap-on cover makes installation quick and easy. Suitable for low density ceiling applications. Symmetric, asymmetric, and light shield reflectors available. For surface or pendant mounting, individual or continuous row mounting. Available with specular aluminum reflector (87% reflectance), high efficiency white reflector (92% reflectance), or high efficiency specular aluminum reflector (95% reflectance). Die-formed heavy gauge steel housing with ample knockouts for east of installation. LED: Highest quality driver, emmitters and power supply for long life. All parts finished with high gloss baked white enamel with minimum 89% reflectance applied over iron phosphate pretreatment for maximum adhesion and rust resistance.